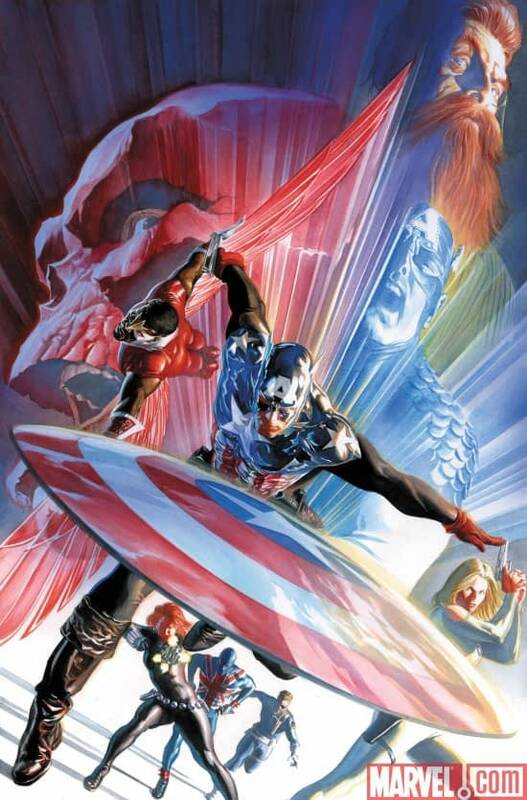 Home » BC Network » Recent Updates » (UPDATED) Captain America 600: The Review. Or, Rather, A Review. Last week, casaldi80 on the BleedingCool forums posted that he had a copy of the much sought after Captain America #600. Yesterday he posted a review. I call it a review, it’s more of a synopsis. It certainly gives away, well, everything, in terms of plot points. You want to read it? Go ahead, I’ve reproduced it below. But remember that Ed Brubaker is a masterful comic book storyteller so you may like to wait till you actually get the double-sized comic book in your hands. One thing though, the book doesn’t give much away as to why this is expected to be quite such a media event. It seems, as always, there are things we know we don’t know. And things we don’t know we don’t know. Damn, Donald Rumsfeld was right all along. So let me know how it goes. When this goes live and the news starts to break, in whatever form, I’ll be sat in a cinema in London watching Transformers 2… unaware if the world is ending! Take it away Casaldi80!!! You’ll have to pardon me as I meant to get this up yesterday, but work and too much celebrating of the Penguins Stanely Cup victory got the better of me. This review will be filled with SPOILERS. If you want to read the issue without knowing what happens, STOP READING NOW. Thanks! Captain America #600 is a big book. There are five stories in the book, although two of them are reprints. Additionally there’s a cover gallery and a Joe Simon retrospective on the creation and enduring legacy of Captain America. Also, there are no advertisements in the body of the book, leaving only the inside front and rear cover for ad space. Of all the contents in the issue, the main focus will undoubtedly be the 40 page story written by Ed Brubaker. This is the story that continues the four year storyline Ed Brubaker began with the “death” of the Red Skull back in issue #1. It’s also the story Marvel hopes will propel this book into the national spotlight, meaning this book must fill two important roles. In the first role, this book undoubtedly succeeds. Entitled “One Year After”, the story begins with a news reporter narrating a video montage while standing on the steps where Steve was assassinated. From there, the scene shifts to Sharon Carter recapping her memory of that day. But something is different as her memory has been becoming clearer and she remembers little things that seem out of place, specifically about the gun she used to kill Steve Rogers. This leads her to the apartment of the man who took the gun from her immediately following the assassination. Using a mixture of brute force and Fury tech she questions the man, finds the gun, and learns, to her relief, that the gun she used “…is not a normal gun…”. Cut now to the 1950s Cap reflecting on both his life and the current state of America. After a fist fight with some local-yokels who broke into his truck to get his costume, he surmises that the world needs a Captain America like him, but he needs to find the right people who deserve to be saved. Now we move to Rikki Barnes. She’ been stranded on our world since the events of “Onlslaught Reborn”. She has tracked Eli Bradley to his high school, and from there follows him home where she sees Isiah Bradley broken and deteriorated. Eli changes into his Patriot costume, then confronts Rikki Barnes. After a small fight, they talk. She tells him her story and he eventually convinces her to come with him to a memorial vigil that is being held for Captain America in Central Park that night. Another scene change. On a television screen in the HAMMER Federal Holding Facility in Colorado where Crossbones is being held, inmates are watching a CNN report on the only known shooter of Captain America, Crossbones. He begins to brag about his actions that day saying “…they don’t even know what happened…”, and one of the guards is so repulsed that he is compelled to taser Crossbones to shut him up. The guard then begins to beat Crossbones teling him they’ll get him a hospital bed next to his girlfriend when he’s done with him. Upon hearing that Sin is in the same facility, Crossbones kills the guard and goes on a killing spree until finally finding Sin’s room. The two share a kiss as the guards launch riot gas into the room. Before drifting off into unconciousness, Sin says, “…they don’t even know…” in reference to the killing of Steve Rogers. The scene changes to Cap Bucky working out with <strike>Hawkeye</strike> Ronin, Cage, and Black Widow. Bucky’s plan is to attend the Central Park Vigil in full costume as a way to honor his fallen friend. Natasha warns that Osborn will be there, with his Avengers, and the only thing Bucky will do is provoke Osborn into turning the memorial service into a battlefield. She leaves and Bucky is left to think about his idea. Shift to the Red Skull in his Arnim Zola created body. He reflects on the times he nearly killed Steve Rogers in the past saying that no one was allowed to kill Rogers but the Skull himself. He then closes with, “…someday they’ll all see what I’ve done and they’ll know I was your better…”. Last part. The heroes gather at Central Park for the vigil. The New Avengers (plus Black Widow and Falcon) have all arrived, but in street clothes. Above, Osborn hovers with Ms. Marvel and Sentry at his side. Sentry, with his vision powers, spots Bucky and the rest of the heroes in the massive crowd that has gathered. Ms. Marvel asks if they should engage, but Osborn says no as he instead wishes to turn the vigil into a PR move for his agenda. As Osborn unleashes his spin, Sharon Carter finds Falcon with the other heroes. She seems relieved and happy despite the mood at the vigil. When Sam asks her about this, she responds that she’s the best she’s been in awhile because she thinks they can still save Steve. The story ends with Bucky shocked by Sharon’s words and the tag “To be continued in…REBORN!”. So, that’s the whole story. Of course, you should definitely read it as that synopsis doesn’t do it any justice. However, at the start I said that Marvel has this book positioned to both continue the story and to somehow generate attention from outside the usually-insular comics world. As I’ve said on this forum before, I’m not too sure how this book will achieve that second goal. The story was rather continuity heavy. If the last issue you read (or most likely bought) of Captain America was #25, this book certainly doesn’t pick up right from there. Those outsiders made curious by the books appearance in the news will no doubt have many questions after reading the book. Who’s Rikki Barnes? Who’s the blonde guy who looks like Cap, has a Captain America costume, did some time as Captain America, but is in fact not Captain America? Who’s Eli Bradley, and what does he have to do with anything? These are just a few of the questions I would think non-comics readers will be left with. If Marvel is going purely for the speculators, people who think this book will be worth thousands of dollars some day, I’m pretty disappointed as the industry went down that path in the 90s, and look where it lead. All I can figure is there’s more to be announced tomorrow with Marvel’s “mainstream” coverage. As an experiment, I’m going to have my girlfriend read the book. She mostly reads X-Men and Wolverine. She knows Cap’s dead, but that’s about it. I’m curious to see how she reacts to the book. Hopefully, she’ll do what Marvel wants this book to do, and after reading #600 she’ll ask to read my Captain America omnibus. Then maybe she’ll read more Avengers-oriented comics. If nothing else, that’ll give us some common ground on Wednesday nights! Magic bullets, Red Skull plots and the beginning… of something new. So what are we going to learn about Reborn? Oh, there are still so many mysteries! UPDATE: The NY Daily News now has an article up on the story — Captain America is coming back to life in a comic near you.